Because it has such a wide range of calls, some seventeen sound signals, this has given rise to some of its folk names such as “hissing owl” and “screech owl.” Some of these sounds are non-vocal, such as tongue-clicking, which was previously thought to be the bird snapping its beak. The screech is a penetrating, tremulous hissing scream of two seconds duration. Other sounds include a non-tremulous wailing which has been likened to that of fighting cats; a defensive hiss; "snoring" a sustained wheezy rasping or hissing; as well as a mixture of twitters, squeaks, chirrups and purring (the female’s being of a higher pitch). The always hungry owlets hiss, begging for food. All four of the Southwestern deserts. The barn owl occurs in great numbers in Southern California. Hunts in areas rich in rodents along desert washes and canyons, where trees for perching are available. The barn owl can readily be distinguished from other owls by its unique shape, color and voice. This distinctive, medium-sized owl grows 15 to 20 inches in height. It has long, feathered legs and makes a loud, rasping hiss, rather than the hoot associated with other owls. 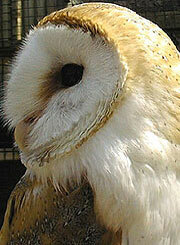 The Barn Owl is primarily white with buff, yellow and tawny shadings. It is delicately freckled with dark specks and the blending of colors in day-light has led some to call it, the "golden owl." Other common names are for it are the "White Owl" and "Monkey-faced Owl." The barn owl's face is arresting. There are no ear tufts. The eyes and beak are completely encircled by a heart-shaped facial ruff of white, rimmed with tan while slightly curved feathers radiate out from the small, dark eyes. The eyes of owls look forward in a fixed position and cannot move to the side, as the human eye can. 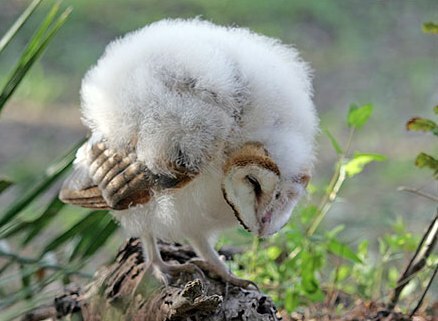 Therefore, to see to the side or back, the owl must turn its whole head. They see extremely well at night. Their hearing must be extremely acute also, for it is known that a barn owl can strike a mouse in the dark. 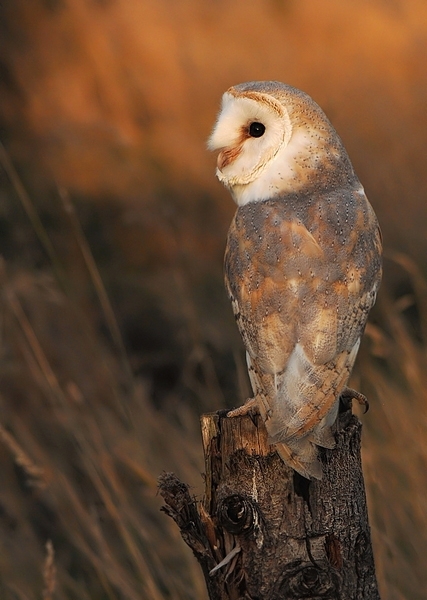 Barn Owls are more nocturnal than other owls. 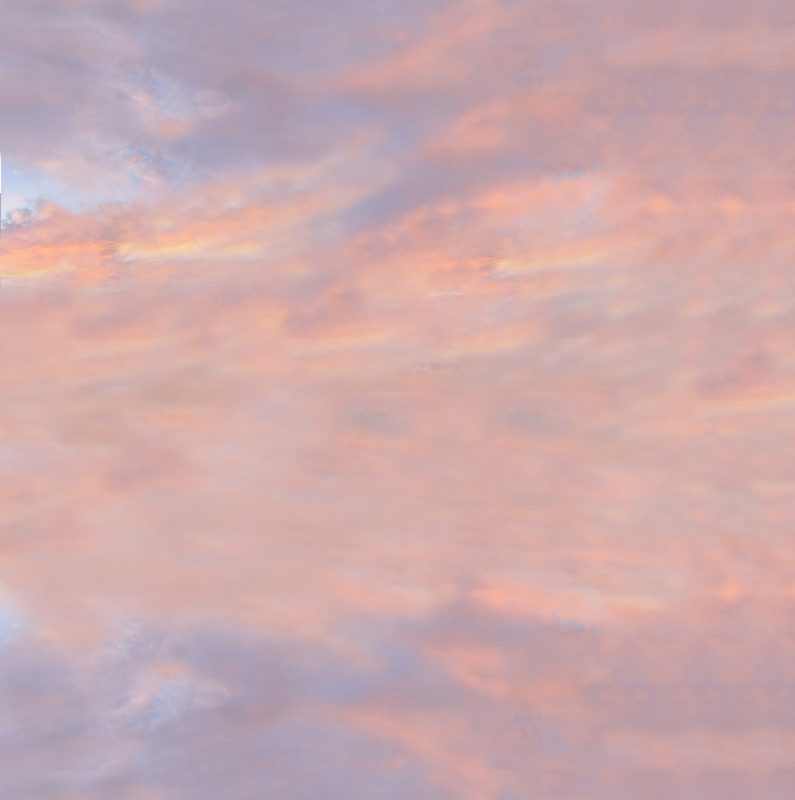 They wait until dark before starting out to hunt, except when the demands of their young may start them hunting at twilight. Normally, before daylight, they retire to some shadowed or enclosed area in an old building, a hollow tree or a hole in a rocky cliff and remain there drowsily inactive all day. 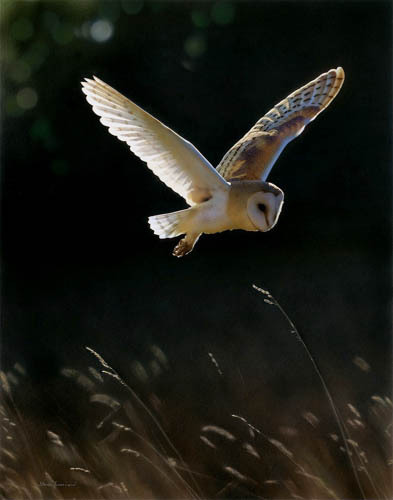 When hunting at night, the Barn Owl sweeps the fields on silent wings catching its prey with its long, slender claws. It prefers small mammals but occasionally in winter when mice and gophers are scarce, it will take small birds. The prey is tom apart and swallowed -- bones, skull and all. The indigestible parts are formed into pellets and disgorged at the roosting area or about the nest. Barn owls choose nesting sights almost anywhere, in old buildings, hollow trees and on or in the ground. No effort is made to build or even line the nest. The female lays from 5 to 7 white, spotless eggs at intervals of 2 or 3 days. Incubation starts after the first egg is laid. It takes from 32 to 34 days for the first egg to hatch, so a nest may contain 4 or 5 young of different size and age. 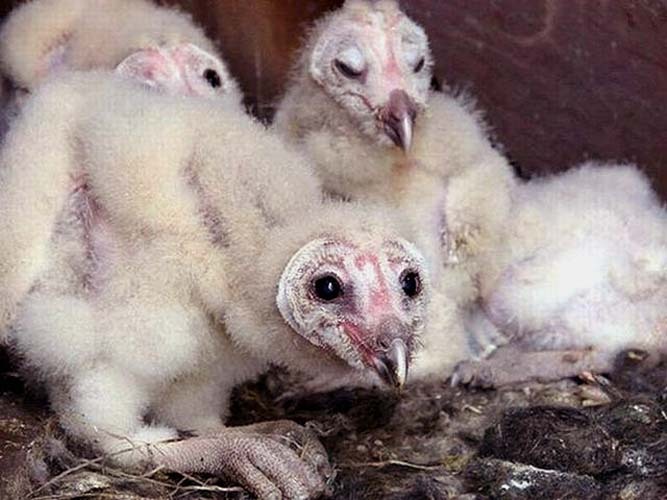 The young are called "owlets." They are covered with snow-white down for 6 days. This is gradually replaced by a buff-colored down which develops into a thick, woolly covering that is still in evidence for about 50 days. The little owlets are hungry all the time. Both parents are busy night after night ransacking the adjoining areas to catch an unbelievable number of small ground creatures to feed their ravenous babies. Adult plumage is acquired in about 7-1/2 weeks, at which time, after much practicing about the nest, the young venture out for their first lessons in flying and hunting. Barn Owls mainly hunt by sound rather than by sight. 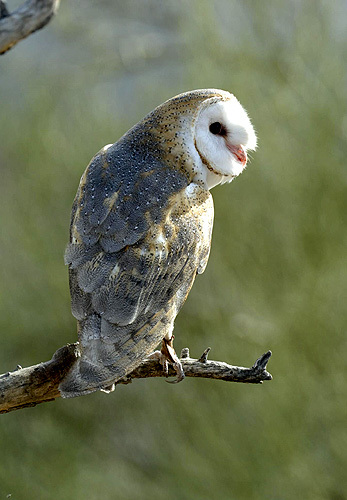 With its acute hearing the Barn Owl can detect even the slightest movement & sound of its prey. The ears are set asymmetrically, meaning one ear is higher than the other. The ears are located under the feathering of the inside edge of the facial disc, located next to the eyes. The facial disc acts as an amazing sound funnel, collecting & filtering sound. This allows the Owl to detect the movement of its prey with complete accuracy. a mouse's heartbeat in a 30ft sq room!